The United States men’s national soccer team the Americans came away with a draw at Mexico’s famous Estadio Azteca, and finished a trying stretch with four points from two matches. MEXICO CITY – At the start of U.S. national soccer team training camp in Denver, Bruce Arena told his players they shouldn't expect a normal routine. The circumstances, after all, were hardly normal. The Americans would have to play two World Cup qualifiers in 72 hours at altitude in two countries – demands that required both enhanced preparation and an unusual number of starters. Typically, from match to match, a coach will make a few lineup changes. In this case, after a 2-0 victory over Trinidad and Tobago on Thursday in Colorado, Arena planned to swap out at least seven and perhaps the entire group. 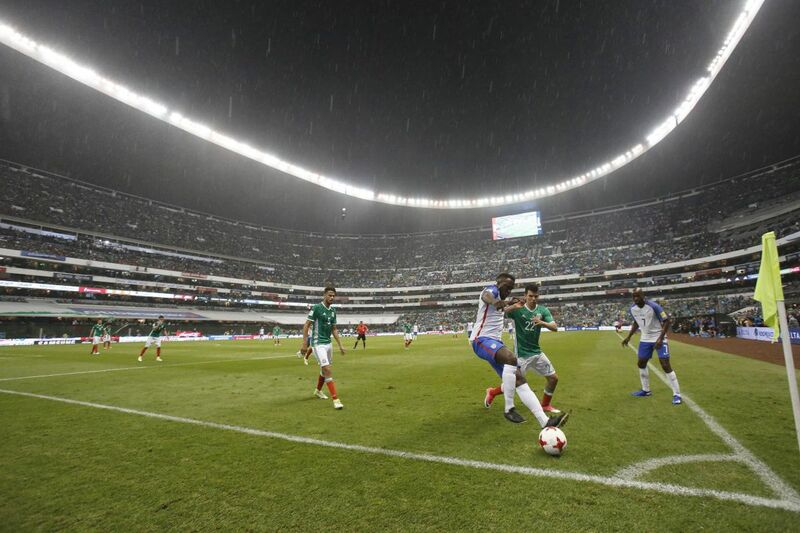 "I was close to nine yesterday, but fell back to seven," Arena said after a 1-1 draw with Mexico on Sunday. The short gap between matches and the impact of altitude on unaccustomed minds and bodies prompted the heavy number of moves. "To repeat the lineup we played on Thursday," he added, "we would've struggled big time in the altitude." With a fresh unit, the Americans came away with a point at Estadio Azteca and finished a trying stretch with four points from two matches. Since starting the final round with two defeats under former coach Jurgen Klinsmann, the Americans (2-2-2) are unbeaten in four straight and back in contention for one of the region's three tickets to the 2018 World Cup in Russia. Arena invited 27 players to camp. One left with an injury. Barring an emergency, two of the four goalkeepers weren't going to play. Eighteen of the remaining 24 started at least one match. Four players started both: DeAndre Yedlin, Michael Bradley and Geoff Cameron went the distance twice, and Christian Pulisic lasted until stoppage time of the second game. The fittest player on the team, even Pulisic was "basically done," Arena said. Arena also asked his group to play two different systems: a standard, attack-oriented formation at home and a flexible, defensive-tinted alignment on the road. In both cases, the plan worked as the Americans claimed three points in the match they urgently needed to win (against last-place Trinidad and Tobago) and collected a point in Mexico City, where they've never won a qualifier, dating to the 1940s. When camp opened in earnest May 29, the players had to embrace both the altitude conditioning (which emphasized proper nutrition, hydration and sleep) and separate playing styles. On the conditioning front, "We worked the best we could over the two weeks to try to get adjusted and try to level the playing field a little bit when we came here" to 7,350-foot Mexico City. Arena said. "We know you can never really do that. We certainly benefited from the things we did over the last two weeks." At the start of camp – Arena's first with an almost full-strength roster – the team worked on shape and tactics for both matches. As the first qualifier neared, work centered exclusively on the strategy against Trinidad and Tobago. By late Thursday, after Pulisic had notched two goals in the second half, the staff pivoted to Mexico. As far back as January, Arena said, he wanted to play with five defenders instead of four in order to cut down Mexico's space in the final third of the field and handle the inevitable pressure that comes at Azteca. "I tossed it around in our office with the [assistant] coaches," Arena said. "They were probably not real supportive of the idea. I was pretty confident we could implement it." What formation did the United States use? On the surface, it was a 5-4-1, but depending on circumstances, the shape shifts. While fans and reporters obsess over formation details, Arena has never gotten caught up in such labels, going back to his coaching days at the University of Virginia and D.C. United. "3-4-3, 5-2-2-1 or whatever you want to call it," Arena said. "Somehow, if you can add up to 10, that's what it is." Aside from fresh bodies, Arena looked to players with experience at altitude. Defender Omar Gonzalez and midfielder Paul Arriola are employed by Mexican league clubs – Pachuca and Tijuana, respectively – that visit Mexico City during the season. A third Liga MX player, defender Jorge Villafaña, suffered a minor injury in his start against Trinidad and Tobago and wasn't available Sunday. A few others had worked at altitude on the club or national team level. Fitness and altitude have the least impact on goalkeepers. Nonetheless, Arena replaced Tim Howard with Brad Guzan. Why? At 38, Howard does not recover between games as quickly as he once did. Plus, Arena said, Howard's groin surgery last fall has impacted his kicking ability. And against Mexico, Arena explained, the U.S. goalkeeper would find himself clearing the ball and taking goal kicks more often than, say, against Trinidad and Tobago. Guzan, 32, conceded a well-struck goal by Carlos Vela midway through the first half and watched Hector Herrera's second-half free kick smack the frame. Otherwise, he managed the box well and handled the routine saves. Michael Bradley, the U.S. captain, had given his team the lead in the sixth minute with a chip from 40 yards that floated over retreating goalkeeper Guillermo Ochoa. Bradley also hit the post from distance late in the match. Aside from picking up points, the Americans grew tighter as a team after losing its way – and some of its fight – under Klinsmann. "This is critical because you meet even fewer times a year now," Arena said. "Most of these players will disappear until September. And to leave with a bond they've acquired the last four games is very important. So the next time around, I'm optimistic we can be better. .. The players have responded very well. We're really becoming a team." The Americans will host Costa Rica on Sept. 1 and visit Honduras four days later. Between now and then, Arena will assemble a mix of regulars and secondary players for the CONCACAF Gold Cup in July at various U.S. venues.